Our guide to Newport will help you find the best bed and breakfasts in Newport Rhode Island. There are tons of great bed and breakfasts in the city of Newport, our city guide will help you find the best bed and breakfasts. You may have a hard time deciding what to do in Newport, but we make your decision easy. 113 Touro St, 0114018461323 - The Yankee Peddler Inn in Newport, RI offers rare charm and easy elegance - immediately making guests feel right at home at our cozy Newport hotel. 22 Liberty St, (401) 846-7444 - The Elegance of a Hotel with the warmth and Intimacy of a Bed & Breakfast off historic Bellevue Avenue and walking distance to most attractions! There are plenty more bed and breakfasts in Newport. 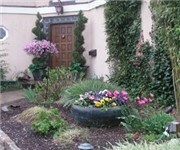 See all bed and breakfasts in Newport Rhode Island.